I have to admit that I am one of those parents that has been slow to incorporate the latest technologies into our homeschool experience. My love and passion are in great literature and hands on experiences for learning. There is so much isolation among our children today, because of technology. Rather than playing in an imaginary world filled with wonderment, so many children sit side by side playing video games without uttering a word to one another. This very image has led me kicking and screaming into the world of devices and apps in our education. There are some things however that I have learned after the kicking and screaming. Because we do try to limit electronic devices during our day, being able to earn time on a kindle device or iPad is a wonderful reward. Generally, this is time that our children are able to cash in at the end of the day after all their schoolwork and chores are done. Our youngest got a tablet for Christmas. He felt that it was one of those “wow” gifts, but there was a definite method to the madness in our choice. The Samsung that we purchased as a built in kids mode that allows us to set a timer on how long he can use his device. This is great for a way of issuing out those reward minutes. 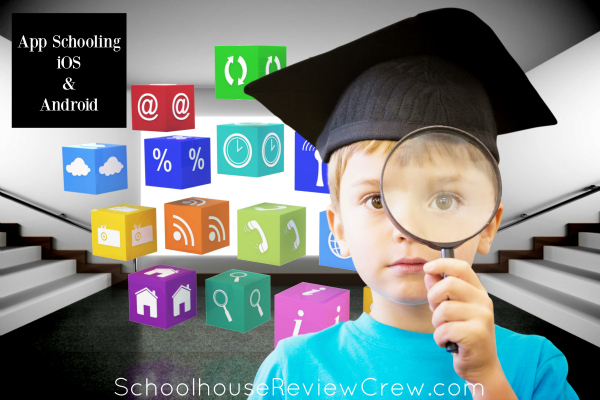 We have found some great supplemental resources in apps. Many of the things that are so much fun and entertaining can also help to reinforce academic concepts and critical thinking skills. These are just some of the ones that our family has enjoyed over the last few years. When talking about supplemental resources for homeschooling, I love to just jump into either the Google Play store or the itunes store and search by the topic we are studying for science and history. It is truly amazing what you will find. Our oldest son is currently studying World War II. I am not sure my iPad has the storage capacity for all the resources I found through the App Store. Along these lines, I have also found App of the Day in the Google Play Store and Apps Gone Free on my iPad’s App Store. These apps highlight other apps that are marked down to free for the day. We have found lots of great things for school just by browsing these each day. I think my best find was a 3D World Atlas app that shows a 3D representation of the earth from the time of the ancient empires through today with a redrawing of country/dynasty/empire boundaries. You can scroll a timeline at the bottom to see how these boundary lines have changed over time. Apps for core curriculum subjects are a bit harder to find, but can be a wonderful resource for any research project, unit study, or study helps. When we start a new online course, I do always search to see if an app is available just for the sake of ease so the kids don’t always have to type in the web address in the browser. There are lots of great resources for the homeschool parent as well. These are a couple of our favorites when we need a little encouragement and inspiration. I am sure that there are many other ways that families use apps in their homes and in educating their children. Please be sure to click through the image below to read how other members of the Crew use apps in their homes.